The Goto SP Series Suspension Lamp is part of a collection of blown glass fixtures made in “rigadin” style with 24k gold specks and “seta” decoration. The Goto lamp is available in multiple dimensions with both incandescent or fluorescent lamping option. 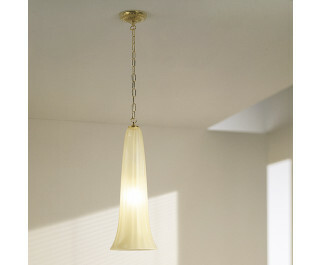 The glass is either white-shaded with all metal parts in white or silk-shaded gold with finishings in gold-shaded metal.